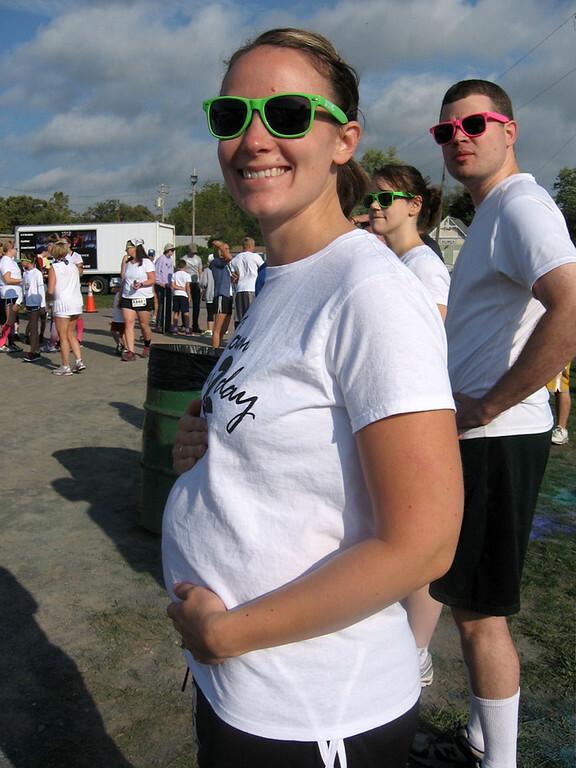 Staying Fit During and After Pregnancy: Mary Ellen's Interview Mama Say What?! | Mama Say What?! You are one of those mamas I always envied, staying fit while pregnant! How did you do it? Thanks! I’ve had a love/hate relationship with fitness my whole life! I feel like I’ve gone back and forth with playing different sports and being super active and then not doing anything for a long stretch of time. I participated in gymnastics when I was a child, played volleyball in high school and started going to the gym when I was in college. I lost 40 pounds in 2008 using Weight Watchers and during that time (and since then), I’ve really tried to make exercise a part of my life. I don’t work out every day, but I try to at least three times a week. I got pregnant with my first son in March of 2010 and continued to work out at the gym until I was about 33 weeks pregnant. Even though taking care of a little one is hard work, (and a full-time job! ), I still tried to make time to exercise. I started running (well, jogging is probably a more appropriate word) and completed a couple of 5Ks in 2011 and 2012. I got pregnant with my second son in July of 2012 and continued to work out. I jogged, used the elliptical, did some Jillian Michael’s DVDs at home and took Zumba classes once a week. What inspired you to take part in the Color Me Rad Run? How difficult was it while pregnant? The Color Run (www.colormerad.com) came recommended by a friend of mine from work. It sounded like a blast and I was intrigued. I signed up for the race with a bunch of wonderful ladies from Zumba and we ran as a team. It was such a great time! 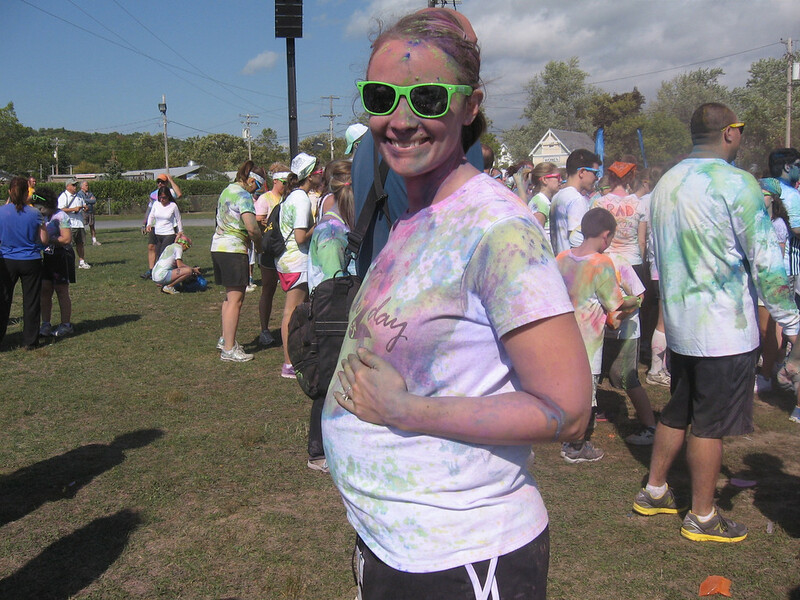 It wasn’t that difficult to run while pregnant because I had been working out a few times a week prior to the race. I was 15 weeks pregnant at the time. Are you planning on participating in another Color Me Rad Run? I’m excited to say that YES! I’m going to run it again this year with my Zumba friends and my hubby as well. Have you participated in any other races? I’ve done a handful since becoming a mother. My last race was the Freihofer’s Run for Women in June. It was one of the hardest things I’ve ever done since I only had my youngest 2 ½ months before, but I ran the whole thing without stopping! 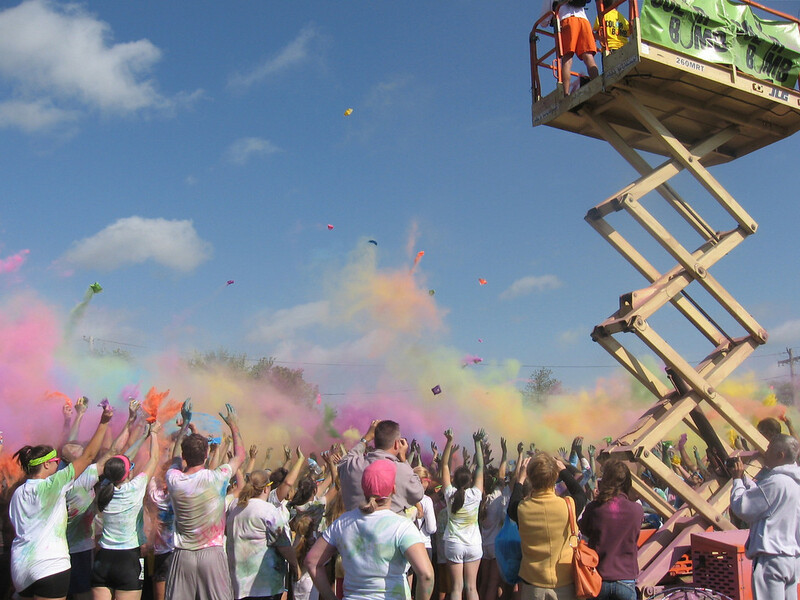 The Color Run is the next one I’m signed up for, but I’m considering finding another race to do before that. You are a working mama and are incredibly busy with two very young little ones, how do you find the time to train? Train? Well…. there’s not much training. It’s more like I work out when I have the energy and the time. I’m a firm believer, though, that it’s important for yourself, your significant other and your kiddos to get out of the house and have some alone time every once in a while! Not to mention, exercising is good for the mind, body and soul, so I try to take some “alone time” to hit the gym at least once a week. I come back home more relaxed and feeling accomplished. Hubby does a great job with the kids while I’m gone and they love spending time with their dad. I’m on maternity leave/summer break now, so it’s easier to find time since I’m not working out of the home. But when I go back to work later this month, I imagine I’d like to get up early once or twice a week to do a DVD in my living room, go to the gym on Saturdays and go to Zumba on Thursday nights. Do you follow a specific training plan or do your own thing? For running, I really just do it on my own. I’ve toyed with the Couch to 5K program, but it wasn’t really for me since I didn’t run as many days a week as it called for. I just try to run as much as I can, then walk when I need a break. Some days I’ll try to run for five minutes and then walk for one. The next time, I’ll try to run for six minutes and walk for one. Do you have any advice for mamas considering running one of these fun races? My advice is to just do it! Especially if you’re on the fence about it, just sign up. The money for the Color Me Rad goes towards the Special Olympics, so you’re also supporting a great cause. It’s impossible not to have fun with a race like this, because the energy of the runners and the spectators is so fantastic. When I did this race last year, I ran faster than I usually do and didn’t get bored because there’s so much going on around you (let’s face it – running can sometimes get boring!) Some other practical advice is to bring a sheet or drop cloth for your car so your seats don’t get dirty. Bring your camera (or have someone hold it during the race), wear white and have a blast! Added by Corey P. on September 17, 2013. You’re such an inspiration! Way to go! Thanks for the inspirational post! I got really off track in my first trimester but now that I feel more like myself again (yey 2nd trimester!) I’ve been trying to get back in the groove of working out. Pingback: My Journey to Fitness: Mary Ellen's Story Mama Say What?! | Mama Say What? !